Anyone know how to remove the rear window switch from a 76 burb? Single switch, with a small plastic surround. Crawling underneath I can see two screws/nuts that have no access front the front. Don't they have snap in side clips? So I'm guessing to reach on back side and squeeze the two tabs on each side? Ok, now the rear switch (key) is not working, and so now I get to fix the whole she-bang. Anyone know where the fuse is for the rear window? I did not see it in the fuse panel under the dash? 1976 Suburban - had it one year-ish. Key switch for rear window worked. It was getting slow to go up, so I took the panel off and greased up the action. of times then stopped all together. Window is down, so I can get the tailgate open, but can't the window UP and out of the way of the electronics! Last edited by swissarmychainsaw; 01-19-2019 at 03:13 PM. My assumption then is The fuse is OK.
My next thought it is the “safety switch”. This is located on the passenger side but it’s under the glass when the glass is in the down position! So it is hard to get to. Ok, I opened it up and did some testing but will need some help. I'll post what I find in as much detail as I can in case that helps someone else! TG Window goes *down* 100% of the time. Light Blue wire sends power to Window motor to go UP. Brown w/white stripe - power to window motor to go DOWN. I have a manual for a 73 and 91, but could not find a wiring diagram for the Tailgate! (Safety Switch prevents the window from going UP unless the tailgate is closed.) Reading on the 'net that this could be the culprit and the symptoms match. Bypass the Safety Switch. Sounds easy right? 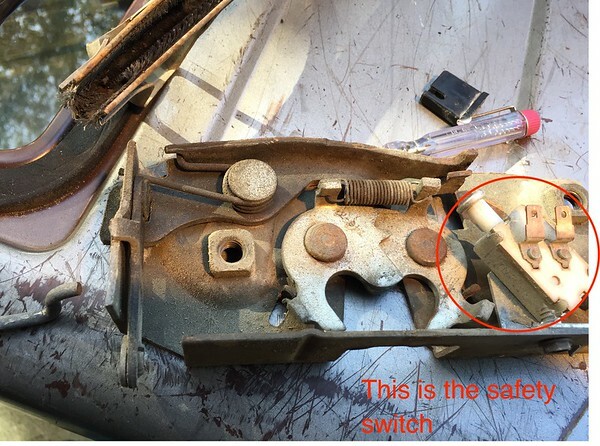 By-passing the safety switch did not change anything. The window only goes UP intermittently. 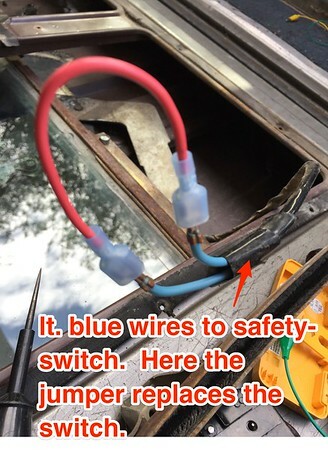 Plugging each Light Blue wire (that would normally go to the Safety Switch) directly into the window electric motor. No change. The assumption here is that ONE of the lt/blue wires should have power. 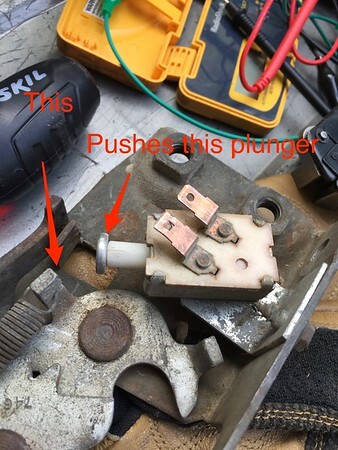 Normally the Brown/white stripe wire is plugged into the upper tab on the electric motor ('upper' when tailgate is open). So I swapped the Brown/white stripe (which has been reliable) to where the lt. blue wire plugs into the electric motor (UP). Then I used the key switch and the window went UP. This means the Brn/wht wire and switch (down position) is reliable AND the motor is fine. Last edited by swissarmychainsaw; 01-21-2019 at 02:21 PM. Next thing to try is the switch behind the key-lock in the tailgate. Anyone know a source for this switch? swissarmychainsaw - I just went through all of this with the tailgate in my 1980 Suburban, so I can understand your frustration. It appears as though you are approaching the stage of "throwing parts at the problem". Before you get carried away with a credit card and the LMC catalog, consider adding an additional ground. Every time somebody has an intermittent electrical problem on these boards, some wiseguy jumps in and says "check your grounds". It's a cliche because it is so often true. The electric window motor in the tailgate gets its ground through the tailgate itself. Depending upon your rust situation or general condition of the tailgate, the ground path may not be good. In my case, the window would go up so far, start to engage the window frame rubber, and then halt. Giving it a "helping hand" would almost always solve the problem because what I was really doing was flexing the tailgate a sufficient amount to re-engage a proper ground. Eventually, even the helping hand stopped working. 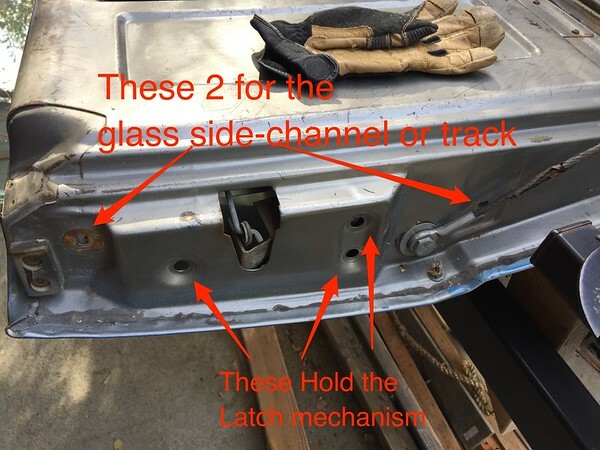 Solution: attach a 10 or 12 gauge ground wire to the window regulator on the driver side in a way that it won't interfere with the movement of the regulator arms. 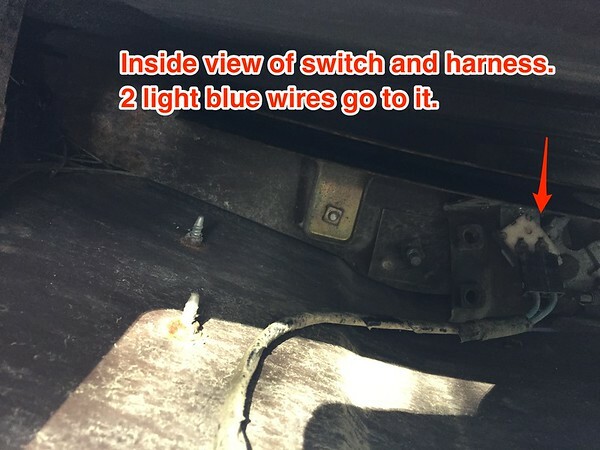 Then run the ground wire into the main wiring loom that exits the tailgate also on the driver side and connect the ground wire to a good location on the frame or body. I am of the opinion this has an excellent chance of solving your problems, but then again it may not. At least with a proper ground path for the motor you can concentrate on other possibilities. Just recently joined and saw your post. Hoping you have it fixed by now, but if not I had similar issues and will share what I learned. Two circuits - dash switch powered when ignition on. Tailgate switch powered all the time. My dash switch works fine, tailgate switch would make glass go up but not down. I put the tailgate in down position so I could squirt electrical contact cleaner into the switch and have it drip down and not ruin paint. No joy. 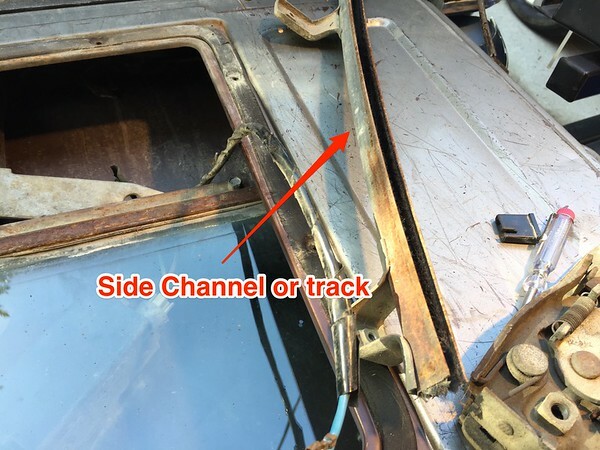 I ended up having to take my entire rear window and regulators out too fix a different issue - rusted out window tracks, which I still have not located. Turns out the switch was fine, just needed cleaning. Took it apart, 20 seconds with a bit of fine sandpaper wrapped around the tip of a small screwdriver and switch works like new. If you have not gotten that far, fyi, beware of the coil spring on there back of the regulator arms. I've taken apart window regulators before, but never one with a giant heavy piece of glass like that. It did not occur to me there would be a helper spring, and you can't see it until you remove the regulator. Took out that last bolt and one of the arms swung around like a frigging bear trap and almost broke a finger.